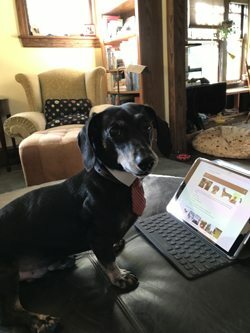 PHOTO PROVIDED Walter, the Daverios’ senior dachshund and guest columnist, gives sound advice to some anxious pets. My owner made an appointment for me to go the vet to get tutored. I’m not sure which subject. I’m feeling pretty solid on most everything: I do my business outside. I sit, stay and give my paw. I come when they call me (usually.) I play nice. Maybe it’s special ops tutoring. Cool! Since it’s the vet, will it involve being petted and prodded in personal places? I like attention, but geez. Any idea what to expect? I’m a border collie, type-A (of course) and I don’t want to fail the test! Um, you kinda heard wrong. NEUTERED not “tutored.” Rhymes, but means something entirely different. You’re slated for surgery, my friend, and the medical term for the procedure is “castration.” It involves a small incision made in the skin just above the scrotum, through which your testicles will be removed. You’ll be totally asleep, and I’m sure they’ll give you something for pain, which isn’t too bad. This procedure is irreversible, and you will not be able to sire pups. And if you were feeling the influence of testosterone (a male hormone) before the procedure, this will be a thing of the past. For some more aggressive dogs, this can be a good thing. You know the type. I know, it sounds terrible, but it’s not. I had it done when I was a wee pup, and I was up and running around like normal the very next day. And as far as I’m concerned, I’m still the same Walter I was before the surgery. It won’t change your personality or your frisbee-chasing abilities. Supposedly, it dampens some male … urges. For instance, I have no real need to seek out romance with females. Miriam and I are in a platonic relationship, which suits us both just fine. Don’t worry, you’ll be the same you, your bark will still be fierce, and the procedure will be over before you know it. And for goodness sake, don’t lick your incision, or you might end up in the “cone of shame.” That’s more embarrassing than the neuter itself. My vet touched me in inappropriate places at my last office visit. No big deal, other than my having to groom myself EVEN MORE thoroughly down there to make sure all was copacetic (it is.) She called me “cryptorchid.” I thought she liked me! I don’t know what that means, but it can’t be good. I mean, a crypt is a place where dead people are buried. And orchids are pretty flowers. I don’t want death flowers. I’m just a kitten! I heard the word SURGERY. Give it to me straight: am I a goner? The term “cryptorchid” has nothing to do with crypts or orchids. From the Latin: “crypt-“ (hidden) plus “orchis” (testicle), cryptorchidism is the term for a testicle that has not descended into the scrotum. (I am a scholarly dachshund!) It may involve one or both testicles, and is known to be inherited. Undescended testicles are likely to form a tumor sometime down the road, so, castration is actually necessary in this situation. During normal development, testicles migrate from way up near the kidneys, through a natural opening in the abdominal wall called the inguinal ring, and down into the scrotum. Testicles that don’t make the journey can be found anywhere along this path, are underdeveloped, and can be tricky to find. Depending on where the undescended testicle(s) reside, you may have two or three incisions after the procedure. Well wishes. Being young helps — you’ll recover quickly. I pee outside. I also pee inside, especially when it’s raining. Or sleeting, windy, dark or if I hear a scary noise. Sometimes, I pee when I get excited — especially when I meet new people. My owners get real mad when they find pee in the house. Sometimes, they lock me in the kitchen for awhile, not sure why. Anyway, it’s been the same for, like, 5 years, and now I’m going to have surgery so I can be “fixed.” I don’t feel broken — so what’s the deal? Your owners need to have a long talk with your veterinarian, my friend. It sounds like they’re looking for a magic cure, and will be sorely disappointed when neutering you probably doesn’t change a thing. Removing testosterone won’t change the fact that you aren’t completely house trained and have submissive/excitement urination. These have become habitual behaviors, which are difficult to break. Yours is a complex problem, and I hope you get the behavioral help you need.